Prospect (no relation) Community Housing have submitted a video to the Scottish Parliament to convey ongoing regeneration work in the Wester Hailes district of Edinburgh to MSP’s. David McLetchie will host a reception for the special screening which marks the 21st anniversary of the community housing group. 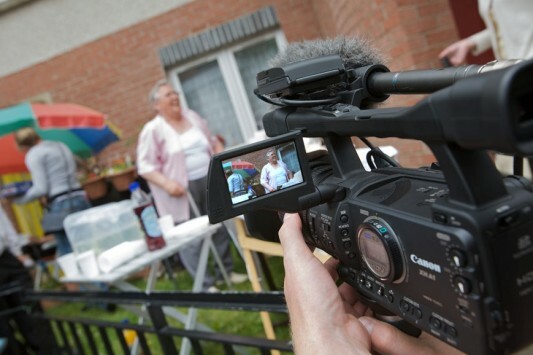 Produced by Andrew Crow of Event Video Services the flick illustrates how two decades of regeneration has transformed one of the cities largest housing estates and aims to convince politicians of the value local organisations bring to regeneration. A range of tenant interviews were undertaken for the project where locals highlight improvements made to the area in a bid to dispel lingering memories of a less salubrious past. Key to the turnaround has been investment in landscaping to replace oppressive greys with floral patterns, tree plantings, gardens and open space.